We rented the Cliff Point house. This was the second time we've stayed at this property and it was great both times! The deck has a perfect view of Lake Superior, we were able to see several ships passing by during our stay. Two Harbors and Gooseberry Falls are very close and Silver Creek Cliff is a short walk from the house. We've rented from Cascade Vacation Rentals 4 times now and plan to continue for all our North Shore vacations, they're very easy to work with and the rentals we've stayed in have all been fantastic. 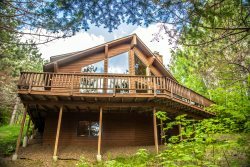 Home has a wonderful view in a great location close to Duluth, Two Harbors, Gooseberry Falls, and Split Rock Lighthouse. Nicely renovated bathrooms and comfortable beds. This was our third rental with Cascade Vacation Rentals, and we will be back! Five years ago we honeymooned, 4 years ago we celebrated our first anniversary, and this time we were "babymooning" as we're expecting our first in early April. It was great to have a getaway close to home and the hospital. We enjoyed the great lake view from the dining room table and deck; the kitchen's amenities, especially the stovetop with cast iron griddle and the coffee maker; the Tempurpedic bed; and the easy access to the lake. One drawback, which we knew because of other reviews, was the road noise. Two things to keep in mind: 1) This place allows pets, which is great for some but not all. 2) The dinner plates seem to slightly catch on the dishwasher, so I washed them by hand. This is just something to keep in mind if you're having a short getaway. Very nice. No complaints at all. Thank you so much for sharing your lake place with us. Great and wonderful weekend. Hiking, biking, good food, movies, games and people we love. What could be better? Even the less than perfect weather was ok! Count your blessings, we hope to return soon! Thank you for sharing this gorgeous place with us. Beautiful weather, enjoyed being out on the deck and watching ships come in. Loved, loved, loved the location, lake views, lake front, privacy, comfort, space, 2 bathrooms, pet friendly, walking up the cliff and also bike trail within walking distance. Watched an eagle dive for fish, saw a beautiful red-head woodpecker. My only suggestion would be to add high-speed internet because unfortunately some of us just have to check into work from time to time even though we are on vacation and it is just easier to not have to go into town, but LOVED this place.